Backflow prevention devices prevent contaminated water or chemicals from flowing back into the public drinking water supply system. Certain types of businesses and homes are legally mandated to install and operate approved backflow preventers. 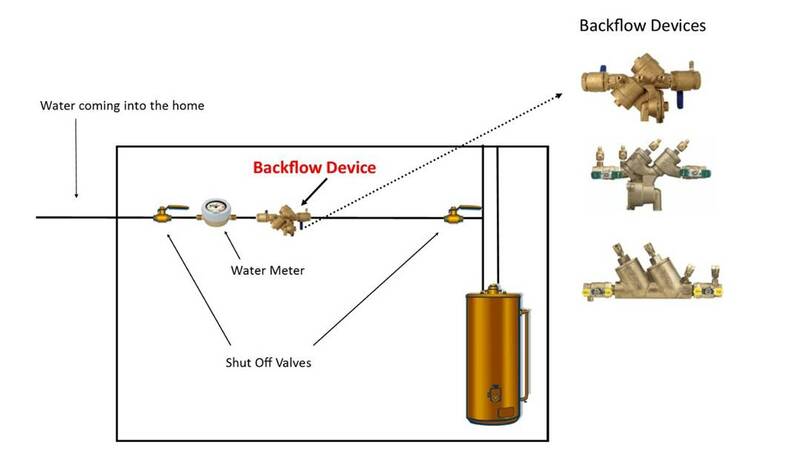 Some homes are required by law to have a backflow device. Backflow devices are most often found in homes with irrigation systems or homes that are serviced by a well. Devices are required by Ohio Law to be tested annually and must be tested by a certified backflow tester. Cruikshank Plumbing has this certification and a flexible schedule to meet your needs. Call into our office to schedule a test or for a free estimate to have a backflow device installed in your home. Backflow devices are not very noticeable and sometimes homeowners are unaware if they have one. Residential backflow devices are often installed in the basement of a home (see picture below) or outside to service an irrigation system. If you are unsure if you need a backflow device or if you have one, call your water department or Cruikshank Plumbing. Most all commercial properties are required by law to not only have a backflow device but to have it tested annually. Cruikshank Plumbing offers convenient scheduling and affordable pricing to accommodate companies in meeting these requirements.